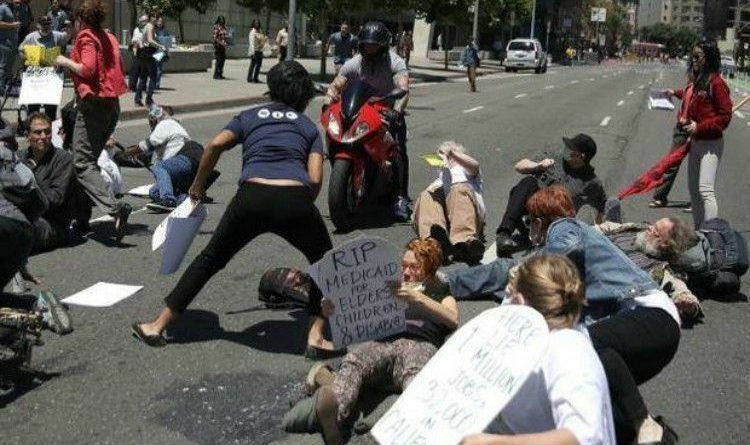 A dangerous motorcycle stunt in the middle of a San Francisco health care protesters was caught on camera. It happened when a man on a motorcycle rode into a crowd of people protesting Republican efforts to change federal health care. CBS San Francisco reports protesters had gathered outside the San Francisco Federal Building at 7th and Mission streets and was conducting a “die-in,” in which a group of around 20 people laid down on Seventh Street to block traffic when the incident occurred. Watch the video below! Emily Lee, a spokeswoman for the group Bay Resistance, which organized the protest along with Senior and Disability Action, said the man drove up on a red motorcycle, traveling the wrong way on Seventh Street. “Everyone thought he was just confused, but he didn’t stop, and at some point, it became clear he was going to come through the crowd and people jumped out of the way,” Lee said. Lee said the man then turned around and began to come back through the crowd. Federal police officers on the scene ordered him to stop and one pulled out a gun when he initially failed to listen to orders to get off his bike, Lee said. Police Officer Robert Rueca said there were no injuries as a result of the incident. The suspect is in custody but charges have not yet been determined. The “die-in” was intended to illustrate the potential effects of Republican health care legislation now moving through the U.S. Senate. A Congressional Budget Office report found that 23 million fewer people would have insurance by 2026 under a similar law approved in the U.S. House of Representatives in May. The event was part of a national day of action regarding the health care legislation, which is moving through the Senate with little public input or notice. Lee said the group lying in the street included seniors and people with various disabilities because they would be among those most affected by the legislation. Obviously, the parents of these people never told them ” Don’t play on the street”. Now, what would have happened if the biker name was Mohammed? Do you think the crowd would have detained him?? ← Trump Outsmarted The Congress, He Will Build The Wall, And Here Is His Plan!